12.14in. x 9.3in. x 0.98in. What do you picture when you think of New York City? 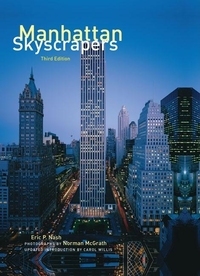 For most, it is the city's distinctive skyline, made famous bycountless movies and photographs Everyone in Manhattan, whether first-time visitor or longtime resident, experiences the awe of gazing up at the soaring stone, steel, and glass towers of Wall Street or Midtown, and wonders how those structures came to be built First published in 1999, Manhattan Skyscrapers was the first book to document the most important peaks in the city's concrete canyons From the earliest skyscrapers built in thecity such as the 1896 American Tract Society Building to the most well known, including the Woolworth, Empire State, and Chrysler buildings, the book has become the definitive reference work on the Big Apple's skyline Now available in a revised third edition, Manhattan Skyscrapers presents more than a century's worth of New York's most fascinating and important buildings Each skyscraper is presented with informative and entertaining texts by New York Times contributor Eric Nash, a striking full-page photograph by architectural photographer Norman McGrath, archival images, interior views, and architectural drawings.In addition to the eighty-five buildings documented in previous versions of the book, Manhattan Skyscrapers showcases eight of the most exciting new skyscrapers built in the past few years These wonderfully diverse additions to the city the New York Times Building by Renzo Piano, the Standard Hotel byPolshek Partnership Architects, 7 World Trade Center by SOM, the Blue Tower by Bernard Tschumi, Bank of America Tower by Cook + Fox, 11 Times Square by FXFOWLE, 200 West Street by Pei Cobb Freed & Partners, and 425 Fifth Avenue by Michael Graves give an indication of how the city continues to evolve in the twenty-first century Manhattan Skyscrapers is an indispensable book for both the serious student of architecture and the casual collector of all things New York."